I wanted to share the last piece of our IVF journey because it is the final chapter in our story and I thank you all for the support and kind messages received since we first announced our struggles. For those trying to get pregnant, we know exactly how you feel and how much you want a baby and our heart and prayers go out to you all. Keep praying and leaning on your significant other and I pray that you all have success like we found through REACH in Charlotte. For those of you who are local, seeking infertility treatment through REACH and who may need financial assistance, please be sure to get more information on our Bundle of Joy Fund at www.kylebuschfoundation.org. I would also like to give a sincere thank you to Jacquelyn Cavitt of Unique Vision Photography for capturing one of the most special days of our entire lives. I won’t lie, at first I was very hesitant at having a stranger in the delivery room with me but Jacquelyn was so professional and sweet! With the urging of family and friends, I was so happy I decided to capture this day in pictures. 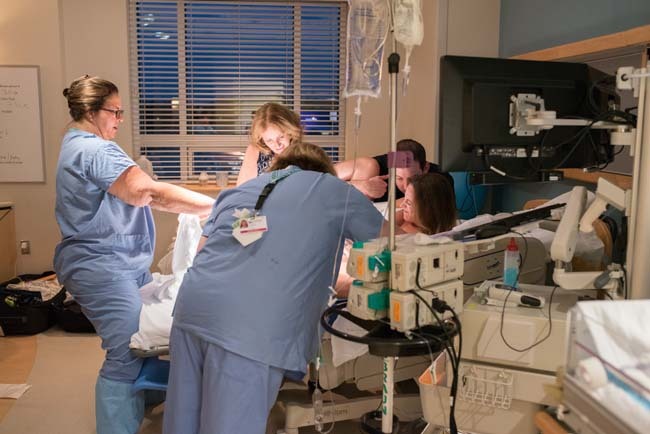 During labor and delivery, it was such a hectic time and many things become a blur; therefore, I am so glad we have pictures to remember this amazing day! I look at them often and will cherish them always. 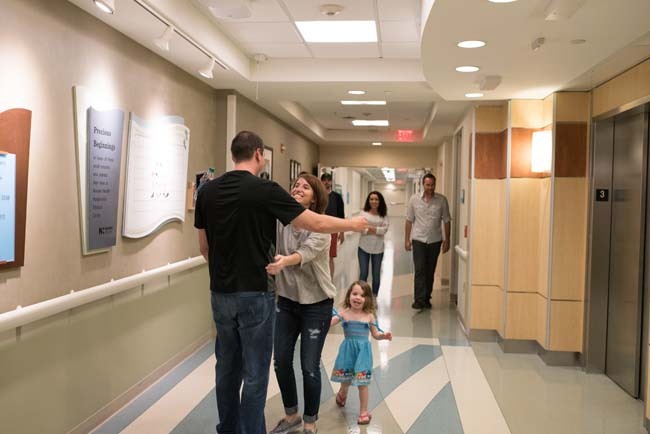 We checked into the hospital at 8:00 am on May 18th to be induced because Brexton was full term and we wanted to insure Kyle would be there for the birth. I had a midwife, Barbara Metzelaars, throughout my entire pregnancy who is part of Novant Health so we got the best of both worlds. I cannot say enough good things about having a midwife from the one-on-one care to the various natural remedies she recommended throughout my pregnancy but also the ability to deliver in the hospital which we really wanted. I have never been so nervous! We waited for this glorious day for so long but now that it was really here I was a bundle of emotions, fear (what is this really going to feel like, will everything go ok), excitement (we are finally going to get to see and hold our baby boy), appreciation (to my husband, family and friends for all their support during this whole journey) and many others. They started me on the induction medicine and the waiting game began. 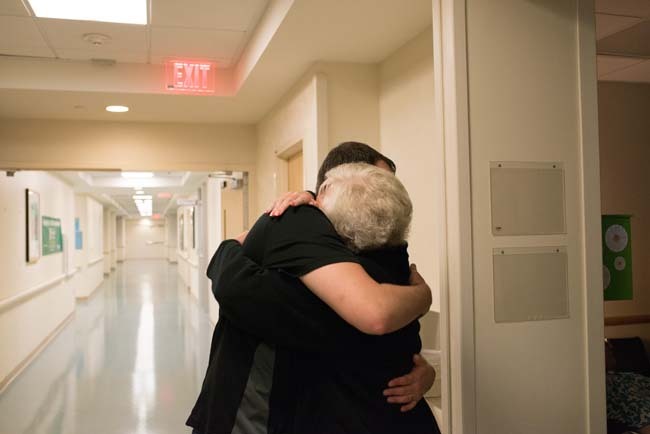 At noon, they tried to break my water since nothing was happening but the angle that it was at made it very difficult for the midwife so we continued waiting passing the time by reading, watching TV and having some visitors. Finally at 3:00 pm I was checked again and they were able to successfully break my water and that’s when labor really started to rev up. Call it a first time rookie mistake but I thought I would be able to get through labor without an epidural. I spent countless hours reading over coping techniques but nothing can prepare you for the feeling of a contraction. My friends tried to explain it to me but honestly it’s so unique for each person. I made it about two hours (from about 3cm to 7cm) before I tapped out. I was able to cope if I could lean over the bed and sway side-to-side but as adrenaline set in more and more, my legs began shaking and it was getting harder for me to stay in this position. I couldn’t find anything else that I found remotely comfortable as the contractions got more intense. 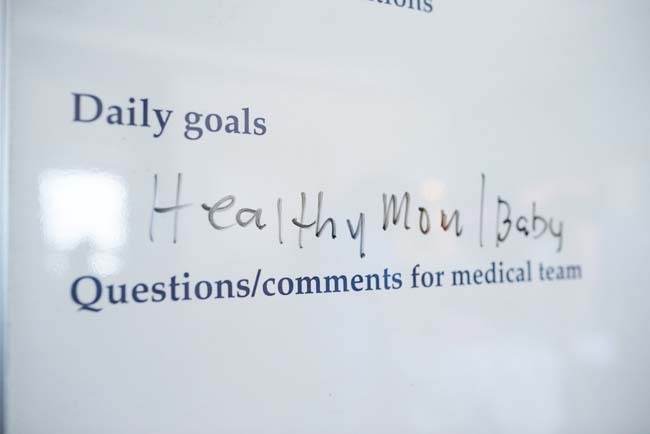 At first, the contractions were strong but I was able to cope through them and was so happy that our son would be welcomed into the world soon. Kyle had even practiced techniques to help with contractions, such as applying pressure to my lower back during contractions, which helped a lot. He was so amazing and supportive! Finally, as I was trying to talk myself into pushing through the pain and continuing naturally, Kyle talked me into getting the epidural. At first I was very upset. I felt like a failure for not being strong like other women who can get through it naturally but you know what, there is no award for natural versus epidural! 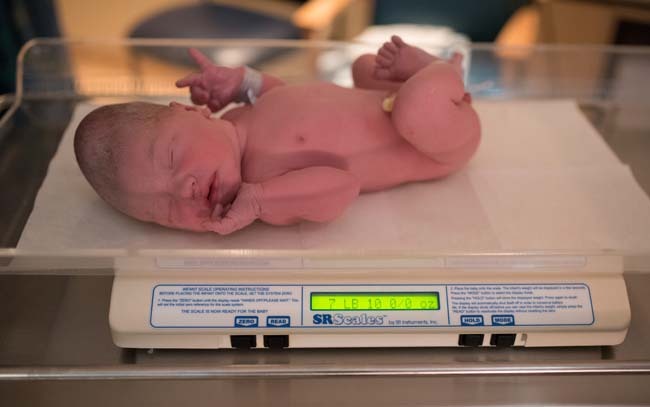 As I waited for the anesthesiologist (which feels like years once you decide to get the epidural), I came to realize that it doesn’t matter how Brexton was going to arrive (natural, epidural or C-section) as long as he was healthy, my birth plan wasn’t really all that important any longer. Plus, dang I was in pain! I had to say bring on the epidural! After receiving the epidural (to the person who created that I LOVE you! 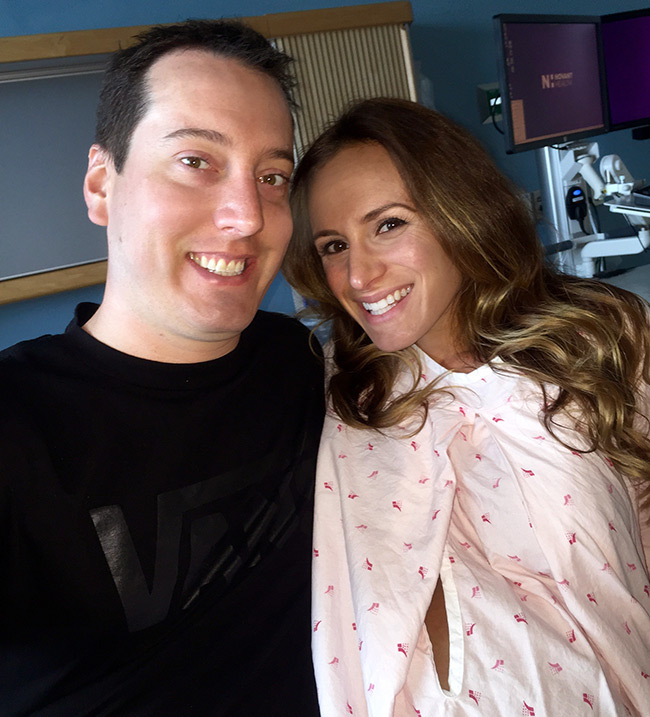 ), I was able to relax for a bit and quickly dilated to 10 centimeters and was told it was time to meet our son. The whole time the entire staff thought that Brexton would be six pounds or under and they thought I would be able to push him out quickly. I heard so many stories of people giving a few big pushes and out came their bundle of joy! This, however, was not the case. For three hours about every minute or so our routine was three big pushes, lean over spit up (I was so nauseous), get oxygen and start pushing again. At about the halfway point I got so sick I felt like the character from the Exorcist and was waiting for my head to start spinning around! I don’t think anything could have prepared me for that, I honestly had no clue I would get so sick! On the plus side the severe vomiting helped to move Brexton lower in the birth canal, that meant progress. Getting ready to get this show on the road, talk about being a ball of nerves and excitement! I can not say enough about my amazing husband, he was the most remarkable coach! He would give me pep talks through all the pushing telling me how amazing I was doing and how much he loved me. He would then hand me my bucket and towel me off after I got sick and get the oxygen for me. He stood, on hurt feet, the entire time never leaving my side. He is truly my rock. 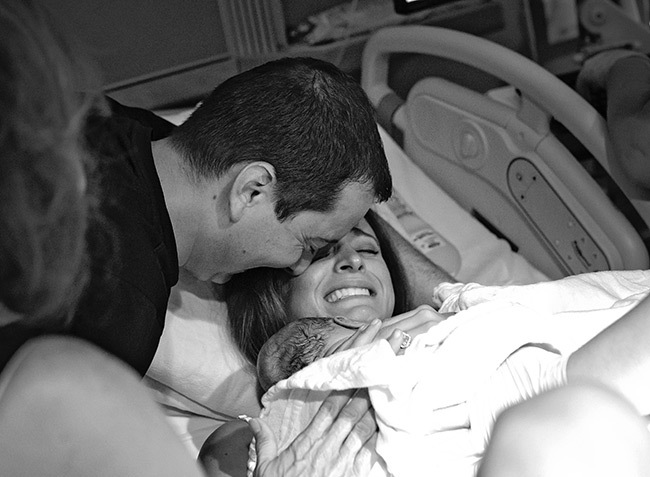 Finally, Brexton arrived and it was the most amazing, surreal moment ever! Words can not describe how your heart swells with immense love the second you see your child for the first time and get to hold him. His little foot against my arm just melted my heart! 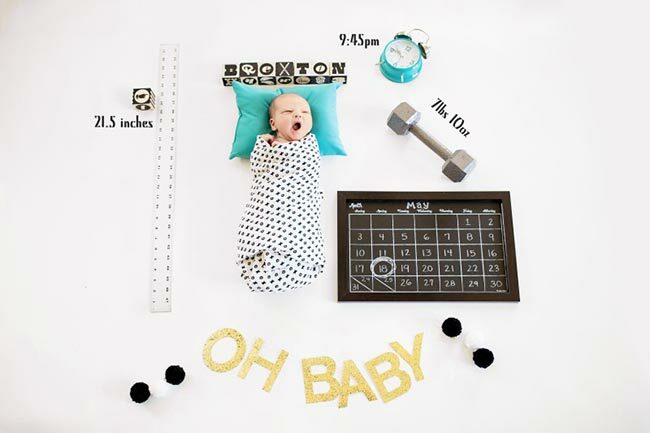 Brexton arrived on May 18, 2015 at 9:45 PM weighing in at 7 pounds 10 ounces and was 21.5 inches long! Our little man had such a cone head but it quickly rounded out! This picture cracks me up though! Proud Daddy sharing the good news with family and friends.